Have a walk around the neighborhood and find a number of interesting shops, specialized in a variety of traditional, geeky, delicious or otherwise fascinating things. If you walk out our door in the direction of the city center you will find Rosebud, the cinema shop, on your right hand side. This shop is a dream for film lovers, because here you will find all kinds of products related to your favorite films. For 25 years they have been offering posters, dolls, postcards and soundtracks of commercial and cult films. You can easily spend an hour exploring its hundreds of objects. Walk on towards the center. Just before reaching Calle Xátiva, you'll see Paris Valencia Bookstore. This giant store occupies the ground floors of several apartment buildings. They have a wide collection of (local) art books, literature, but also nice Spanish children's books to polish up your language skills. Cross the street and walk back in the direction of Zalamera. 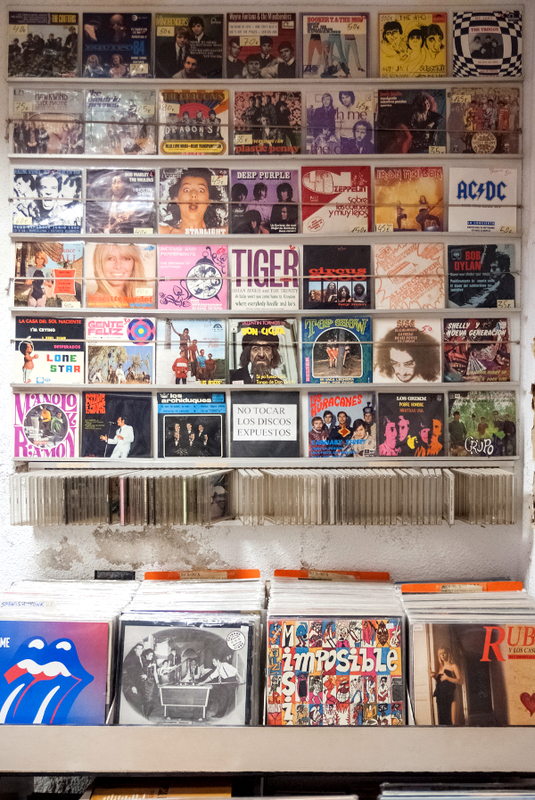 On your right you’ll find a vintage record shop Aceto, specialized in 60's/70’s music. Dig in and find a nice Spanish old style souvenir for yourself or your friends. A few meters ahead is where Imagenes is located, one of the largest comic stores in the city, and the most important specialist in manga. They have been in the trade for more than 20 years, and they have an impressive stock. 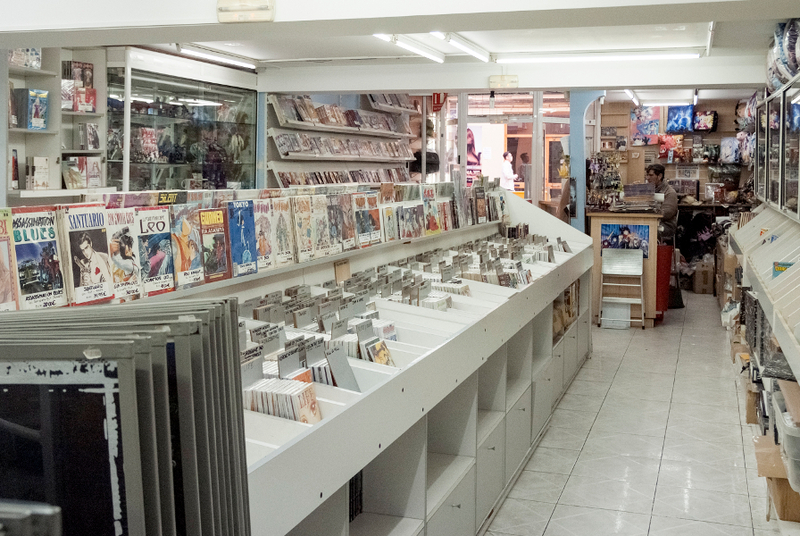 Whatever European, American or Japanese comic you are looking for, you will probably find it here. Walking onwards towards Zalamera, and find Yuen Tong on your right. This Asian supermarket is one of the most popular ones in town. You'll find a wide range of products from various Aziatic countries. Walking towards the center again, turn left into the next street to find La Crida on the corner. This neighborhood bakery is a family business, open every day, even on Sunday. They bake all the bread and pastries themselves every morning, we love their delicious croissants! Walk on straight and to pass by the fish shop La Palmera on your left hand side, named after the majestic palm tree on the street. We love its beautiful sign made with typical Valencian tiles, and the elegance of its colours, white and blue, that transmit a certain Mediterranean spirit. Walk on and turn right on calle San Vicente (the big street). On number 87 you'll find another interesting traditional trade, the picturesque rope store. Yes, ropes! This family business has been selling ropes of all colors and materials since 1942. Even if you are not planning a DIY project, we recommend you to look at its cool vintage floor of colourful tiles. Turn right and then right again on Convento Jeruzalen. On your right hand side you'll encounter another very specialized shop called Menkes, which has been selling dance related products since 1950, such as maillots, tutus, ballet slippers, costumes, etc. Some of the products are created by the owners themselves, with a lot of love and attention. Would you like to buy a flamenco dress as a souvenir? Here you could have one tailor made! If ballet is not your thing, maybe you should check out the skate shop.You will find everything related to the world of the skateboard, from boards and accessories, to clothing, music and even specialized magazines. Too cool for school!